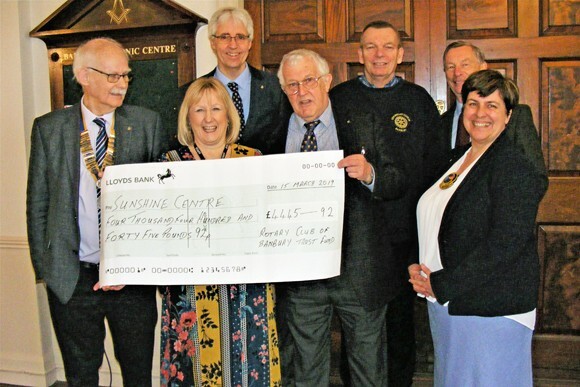 At a lunchtime meeting on Friday 15th March 2019 Banbury Rotary Club handed over a cheque for £4,445.92 to Jill Edge, the manager of Banbury’s Sunshine Centre. The centre, which is based in Edmunds Road Bretch Hill, provides practical help and emotional support to families who need a little extra help. You can read more about their work here. The money was raised by twenty-six primary school choirs that performed at St Mary’s Church, Banbury last November in the Children Singing for Children Concerts. We thank the school staff, the students and their parents and the many people and organisations that helped make these concerts the usual resounding success.